I was in one of my favourite places, San Francisco, last week and decided to pop into CompUSA for a look at Microsoft's new Zune player. The device itself is quite nice, but a look at the physical player itself doesn't reveal the unforgivable yet avoidable weaknesses of the player. It's outrageous that Microsoft didn't make the Zune compatible with its own PlaysForSure standard, instead, attempting to mimic the iTunes-iPod model with the Zune Marketplace. Why couldn't Microsoft have worked hard to make Zune the best Windows-centric download store so everyone would want to use it anyway. Bad move, Microsoft. The Zune is dead in the water unless Microsoft backtracks on exclusivity. The other major miss with the Zune is the restrictions around the wireless access, which effectively only allows you to share music with other Zune users. Even then, the music expires within three days. What a waste of time. If I buy a Zune with wi-fi built into it, I want it to connect via my wireless network to my computer so I can transfer music rather than having to plug the thing in and sync it with the Zune software. At CompUSA, the Zune was barely even given any display space alongside the numerous iPods which were attracting most of the attention. The salespeople didn't seem to know much about the Zune either. I wrote the below article about the Zune's US reception while in San Francisco, which leads me to that strange coincidence. I wanted to quote a good US tech reviewer who had played with the Zune in my story. So I went to CNet, the home of respected music player reviewer James Kim. I've always liked Kim's work and seeing as he's from San Francisco, I thought it would be highly appropriate to quote him. I should say that Kim was a respected CNet reviewer. He was found dead of hypothermia in Oregon last week after getting lost in a remote area with his family. Kim had left his family behind at the car to go for help but the elements conspired against him. It was a real tragedy and ironically, I was watching the manhunt progress as I was in the US. I only ever heard Kim referred to as James, so never made the connection. It was weird that by the time the article went to print back in New Zealand, Kim had died out in the Oregon wilderness. A very sad end for a talented member of the US tech community. Microsoft's challenger to the iPod - the Zune - has had a less than spectacular debut in the US, slipping down the sales charts as American Christmas shopping activity intensifies. After claiming 9 per cent of music player sales in its first week on the market, the US$249 ($363) Zune dropped to 2 per cent of the market in its second week, according to research company NPD Group. That puts the Zune in fifth place, well behind the iPod, which claimed 34 per cent in the same week, but had a 75 per cent share of music player sales in the first nine months of the year. Reviews of the Zune have been mixed, with its wi-fi and video functions, software interface and digital rights management system all being targeted as needing more work. "I do feel the Zune is three-fifths baked, rushed to market to feed the holiday electronics frenzy and nowhere near its potential as a wi-fi-enabled portable media device," wrote CNet reviewer, James Kim. 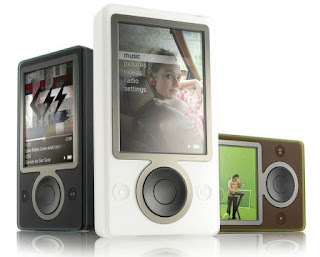 The Business Herald visited several electronics stores in New York and San Francisco, but the Zune's presence was low key, the iPod continuing to dominate. The lack of a stellar start for the Zune may be down to confusion over exactly what type of music it can play. While it supports a good range of audio file formats - MP3, Microsoft's own WMA and AAC included - playback is limited by the digital rights management attached to the music. It means that AAC tracks downloaded from the popular iTunes.com music store won't play on the Zune, but tracks ripped to the iTunes software from a CD are unprotected and therefore will. The device also doesn't support Microsoft's PlaysForSure digital media standard, supported by iTunes' big rivals in the music download space: Rhapsody, Yahoo! Music, and the reborn Napster. Even Zune salespeople are having trouble explaining exactly what playback options are available. At CompUSA in San Francisco, when asked if music from download services other than the Zune Marketplace would play on the Zune, a salesman replied: "Out of the box it can't, but I think there's a plug-in you can download for that." Down the road at San Francisco's Apple store, a giant snowman wielding an iPod Nano music player sat in the front window, grinning wickedly as shoppers milled around the displays. Apple's simple model of one device, one music service keeps working for the Californian computer company. Microsoft wants a piece of the action with its Zune-Zune Marketplace combination but, with sluggish sales, the Zune is likely to remain a niche player this Christmas. Hey Peter, just read your article on the Zune performance over the first few weeks. I purchased a Zune online and had it delivered here. I LOVE the device after using am iPod for many years and three generations of device. The Zune software brought my iTunes music across so nicely, and the device itself (brown is awesome) is beautiful and fits in the hand so well. Very impressed. Is the James Kim from CNET whom you quote in your December 7, 2006 review of the Microsoft Zune the same James Kim recently killed trying to rescue his family in the moutains of Oregon? http://www.cnn.com/2006/US/12/08/missing.family.ap/index.html If so, may be worth a mention in your next review. If not, it's an odd coincidence. Figured you'd want to know...the CNET reviewer of the Zune - Kim - you mentioned has been a front page news story this week. They found him head of hypothermia after becoming snow-bound in Oregon with his family. I totally agree about the Zune...the music sharing thing is a joke...I bought a "Hitch" by a company called Sima and I can transfer/share music directly with any type of MP3 player (no computer or extra power required)... and the music doesn't disappear after 3 days.